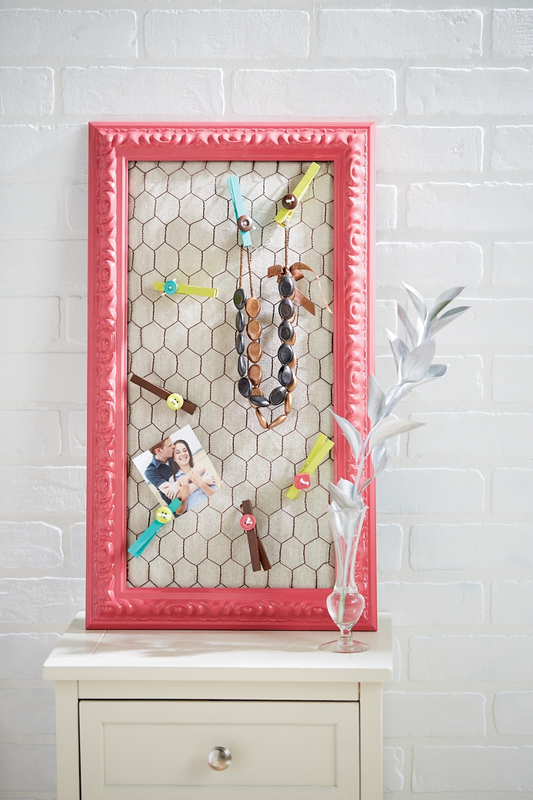 Use chicken wire to create this fun and unique organizer board. Spray paint frame with Krylon® ColorMaster™ Watermelon; repeat coats until desired coverage is reached. Measure inside of frame to determine size of board to be cut. Either cut board with a saw or have it cut at hardware store. Using wire-cutters, cut chicken wire 2-3 inches larger than hardboard. Spray paint wire with Krylon® ColorMaster™ Satin Leather Brown. Cut batting to the size of the board (do not wrap around edges); hot-glue batting in place. Cover batting and board with muslin, wrapping around to the backside of board; hot-glue in place. Wrap chicken-wire tightly around covered board, bending wire to lay flat against backside of board. Insert covered board into frame; secure on back-side with hot-glue in corners and around edges. Cover back of frame with brown kraft paper and craft glue. Spray paint clothespins and buttons in a variety of coordinating colors; allow to dry. Thread embroidery floss through holes of buttons; knot on front side. Use clothespins to hang objects to chicken-wire.